Great planning meeting with our Chairperson Rob Akscyn this morning! We are finalising ideas around the Te Uku Sustainable Actions Community Project. The project will drive a series of 130 Sustainable Actions through this West Coast community. These actions will be elicited through a connection between Art and Education. The Te Uku primary school will pilot an educational, interactive children's journal. The journal will inspire youth to explore their relationship with the environment through art, to start translating ideas into action and it is linked with United Nations Sustainable Development Goals. The project will encourage the students to choose actionable ideas and environmental initiatives through the expression of artwork that can be supported by the whole community. The project has been developed from a previous series of artworks by Yaniv called "Please Do Touch". The "Please Do Touch" series is based on 5 of the United Nations Sustainable Development Goals and represented the good and the bad - what would happen if the goals were completed and what would happen if they didn't. The series connected art, social issues, environmental topics and disability awareness - Yaniv lives with Autism and Epilepsy. Since his exhibitions overseas, this project was re-imagined into an educational resource for people to learn and develop their own initiatives through art. Yaniv is a Raglan local, and has been successful in collaborating with the Te Uku school to pilot his journals and the project. The journals have been developed in collaboration with Te Papa Museum. The Museum will coach the classes for the project to contribute to their upcoming nature exhibition, including a remote virtual visit of the Museum for the students during their project. The Te Uku School is very excited about this project which we would like to start in Term 2 this year, pending results of funding submission to the relevant funder. 1. March: First Now and Next programs sponsored by CCS Disability Action and ran in partnership with McKenzie Centre in Hamilton. This group launched the NZ Alumni and started acting to spread their learning with other families. At the outset of this group, parents created the Families Empowering Families organisation. 2. April: Hori Barton a father alumni and Peer Worker trainee presented with Trisha Benge, Manager, McKenzie Centre, Early intervention: Barton, H and Benge, T. (2018) Now and Next: A novel partnership between families and professionals. NZDSN Wellington. 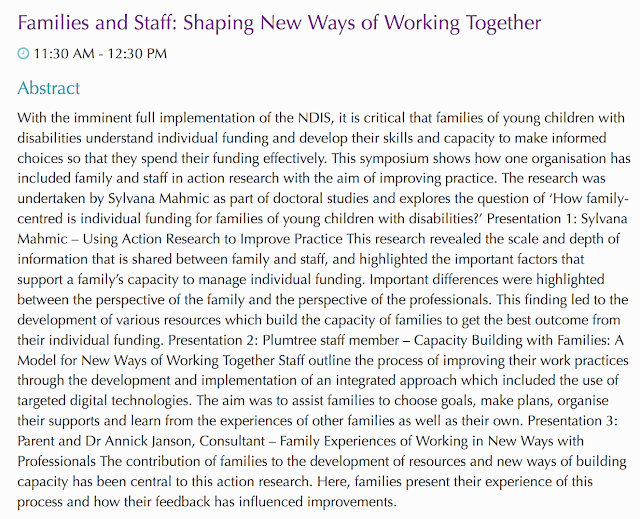 Janson, A., Mahmic, S., Benge, T. & Herbert, C. (2018) How a transformational Collective Benefit Mindset experience prompted parents raising children with disability to launch a peer network. 6. 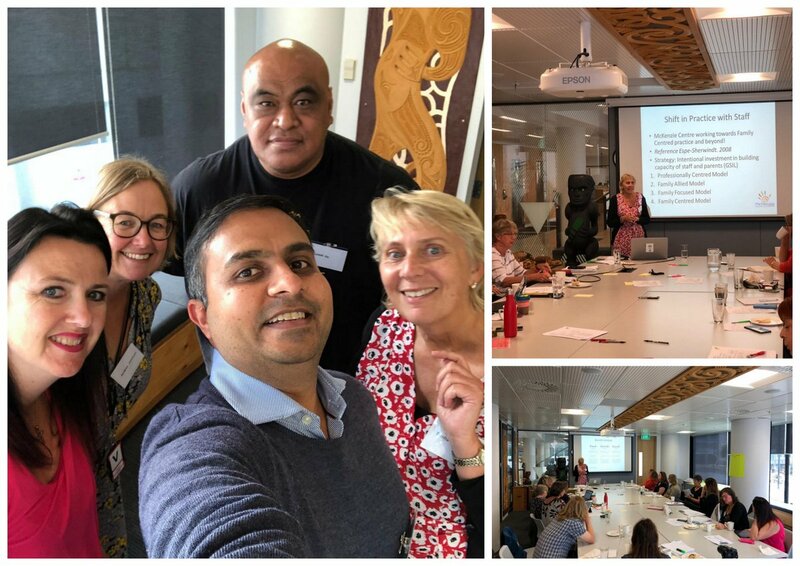 October: Launch of the NZ Peer Workers training program [http://now-and-next-alumni.blogspot.com/2018/11/nz-training-6-peer-facilitators.html]. Six Peer Facilitators in training from Culturally and Linguistically Diverse Communities (CALD), amongst them 2 couples. These trainees will undergo a comprehensive training programme (Pictability visioning and planning, online and face to face facilitation training, participant-observer research introduction, online real time data collection and analysis). Two Peer Workers who contributed by volunteering with the child care crew. We have found that offering childcare for parents to attend the Now and Next program is a critical success element. A couple who had graduated from the first Now and Next program brought their daughter along and joined the crew, along with 2 staff from CCS Disability Action, in addition with the McKenzie staff. Contributing their Saturdays to help other parents benefit from the program is an awesome contribution! 10. CEO IEP 3 meetings - implementing the Now and Next concepts and create new opportunities to build partnerships with professionals. Last March meeting - participants gave this the highest ratings of all courses! On Monday 10 December, 7 of us met at the McKenzie centre to plan the first alumni series! Parents were keen to understand how to implement the knowledge and skills learnt during the Now and Next program to get the best outcomes for their child as s/he transitions to school. 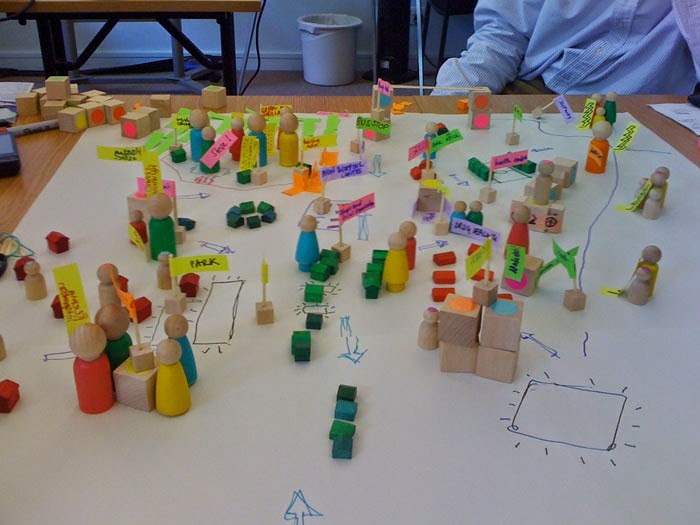 Think practical ideas: what can be implemented at school that can be reinforced at school? 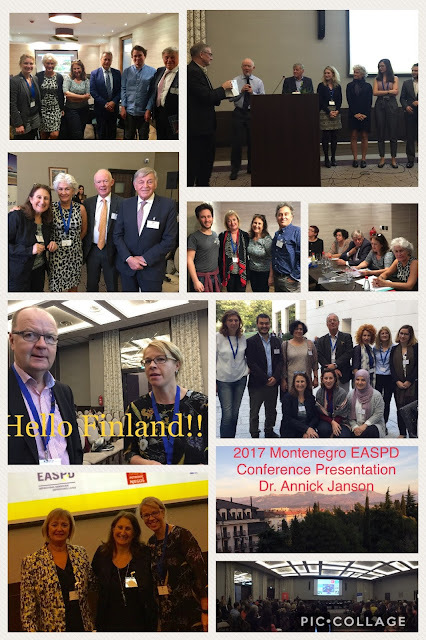 Reconnecting with past EASPD President (Franz Wolmayr) who I met at previous EASPD conferences I was invited to as well as Secretary General (Luke Zelderloo) I was reminded of the power of number. James Crowe, EASPD President speaks on behalf of about 15,000 service providers across Europe. I was also introduced to other executive members as well as the administrators and conference organizers. The Now and Next approach was saluted and got mentioned during the conference at multiple occasions. I am looking forward to building on our existing connections. a. Finland: we agreed to explore future opportunities, including an invitation for their 2018 peer conference, which we could plan with some training... Kirsi Konola who is also on the EASPD Board and Jyrki Pinomaa (President of Inclusion Finland and 2018 President of Inclusion Europe) are colleagues of Simon Duffy and they have already tweeted to each other that this was a meeting of minds. Jyrki is the father of two young adults with disability. b. France: Bernadette Grosyeux also a member of the EASPD executive is interested in collaborating on a European project proposal. There is also the possibility of an invitation to present at a Paris 2018 social change conference – where Now and Next would have an important message to disseminate. a. The EASPD Early Intervention Standing Committee organised for a shared lunch with me during the conference. I have made contact with its head and will be sure to be kept in the loop with their projects. Now and Next is streets ahead of what they have accomplished till now. I have organised an Early Intervention email list for us to stay in touch with a group photo we took at the lunch. b. EURLYAID [European ECIA] President Ana Maria Serrano is interested in the idea. 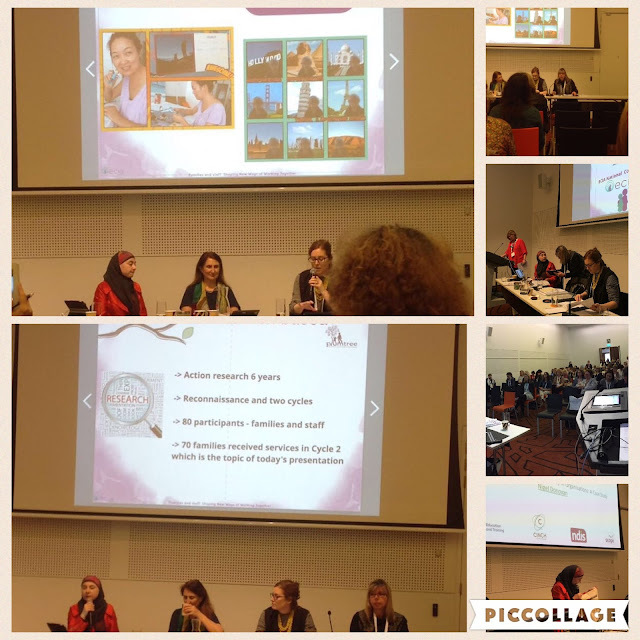 She is also an organizer for the 2019 Sydney ISEI World congress so we will most likely meet again then. c. Jean Judes, GM, Beit Issie Shapiro GM is interested in exploring further collaboration. We had multiple talks during the conference and there are numerous connection points between our approaches. ​d. European countries from the ex-Eastern block receive different funding allocations from their government, so some will be looking to apply for further funding to work with Now and Next. These are exciting opportunities, which are staggered in time from next year. We have met people inspired by our philosophy! Spectacular launch for our State of the Sector report on Youth with Invisible Disabilities at Parliament on Thursday 29 June!! We had TWO ministers there: Hon. 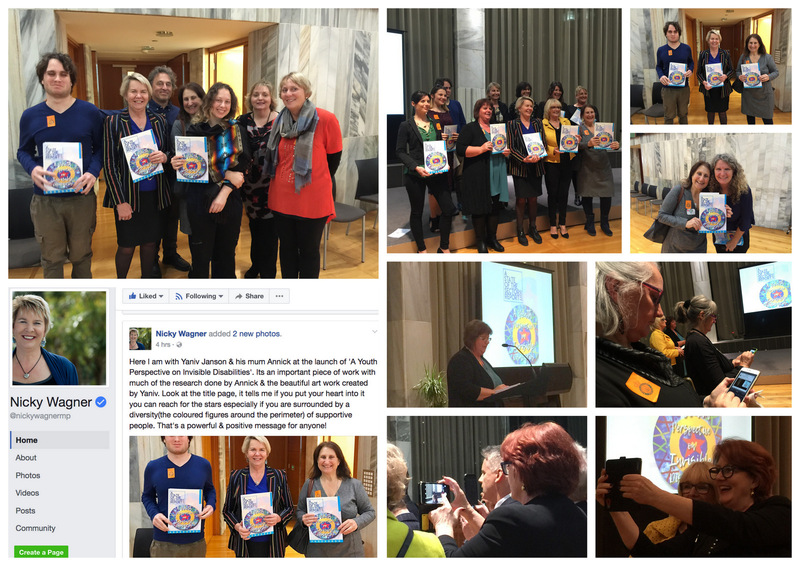 Nicky Wagner, Minister for Disability Issues (top photo with Trish Benge and Helen Gempton, McKenzie Centre and Yaniv, Robin, Annick and Melissa Janson) and Hon. Maggie Barry, Minister Arts Culture and Heritage (bottom right photos), and a host of personalities and supporters. Dr. Annick Janson was invited to the Science and Innovation commission at the Israeli Parliamanent. The meeting was held to mark the International Day for the Rights of Persons with Disabilities. The session was about encouraging entrepreneurship in the domain of assisstive technology. Chairing the commission was MP Uri Maklev: MP Ilan Gilon and Chaim Yelin also spoke. Dr. Janson explained the background for current assistive technology endeavours in Australia and New Zealand and their relevance to the local environment. Yael Elstein, Director Technology Consulting Center, Beit Issie Shapiro introduced the topic outlining the significance of Government's role in nurturing the innovation micro-cosmos. Ms Elstein outlined that it is critical to develop more technologies to enhance the quality of life of people with disabilities, their independence and inclusion. Technologies are core to each person realising their potential. Elstein explained that 1.6 million people with disabilities live in Israel - close to 20% of Israel's population and that the number of people with disabilities worldwide is one billion. In her words, the main barrier for entrepreneurs to develop more assistive technologies is financing. This is why government support is needed. On the other hand, once developed, these technologies benefit society as a whole – for instance vibration, text-to-speech and voice activation technologies were first developed as assistive and were later adopted by mainstream. To conclude the meeting, the chairman of the Science and Technology Committee confirmed that a round table of all relevant government agencies, associations and organizations who deal with the issue will be established. This will benefit the general public at all levels: “it is our duty to work for it." This collaboration is about raising awareness about the Sustainable Development Goals through the disability lens. 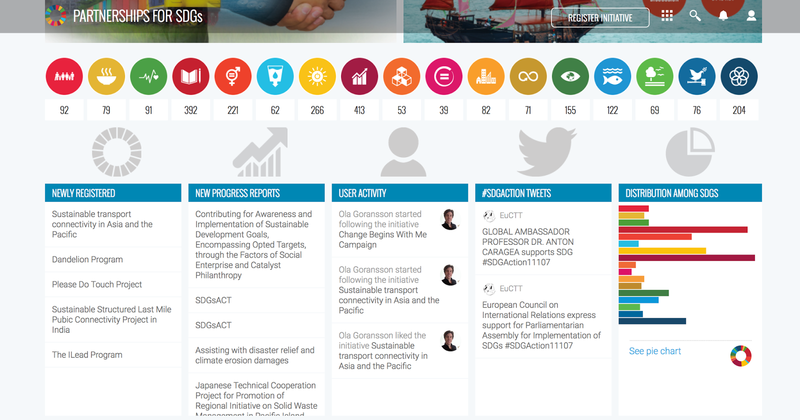 These 17 ambitious goals for humanity were nominated as the United Nations Sustainable Development Summit for the adoption of the post-2015 development agenda. Yaniv has Aspergers' Syndrome and epilepsy. He wants to show the world that people with a disability are passionate about working on the Sustainable Development Goals and that he chose to raise awareness about them through his art. The Please Do Touch installations unpack possible scenarios whereby 5 Sustainable Development Goals would not be pursued. The purpose of inviting the audience to interact with the art by touching and listening to it is to engage with the topic on as many levels as possible. This collaboration's UN webpage is listed below. These most recent works of Yaniv Janson address issues of inequality and the issue of housing. His work asks us to look at the how people feel about their living conditions and what kind of options are realistically available to all people to ensure that everyone has adequate housing. Yaniv’s art draws the viewer in through the use of vibrant colour and then while he has our attention, simultaneously addresses the social justice of inadequate housing and poverty. 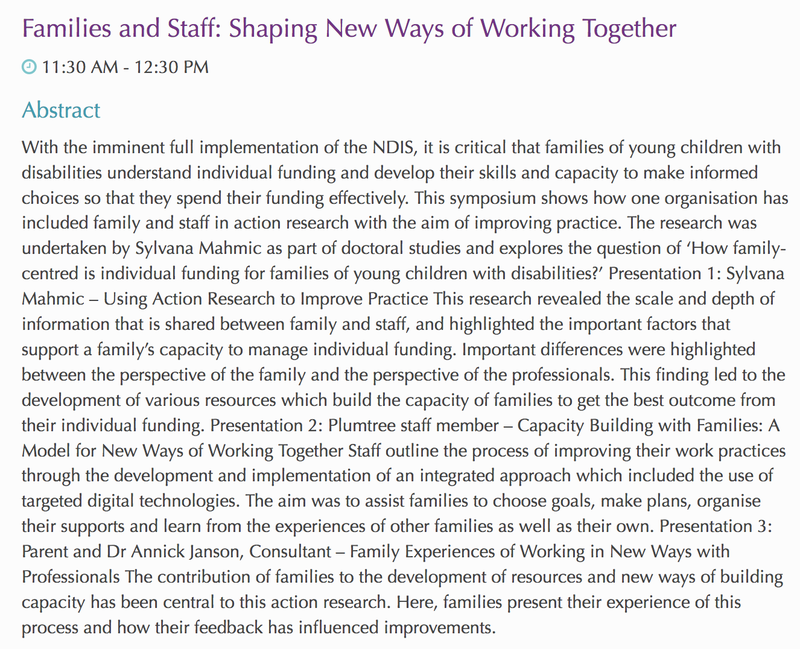 Our team has just presented at the 12th Australian Early Childhood Intervention Association conference in Melbourne on "Families and Staff: Shaping new ways of working together" and the presentation was extremely well received. 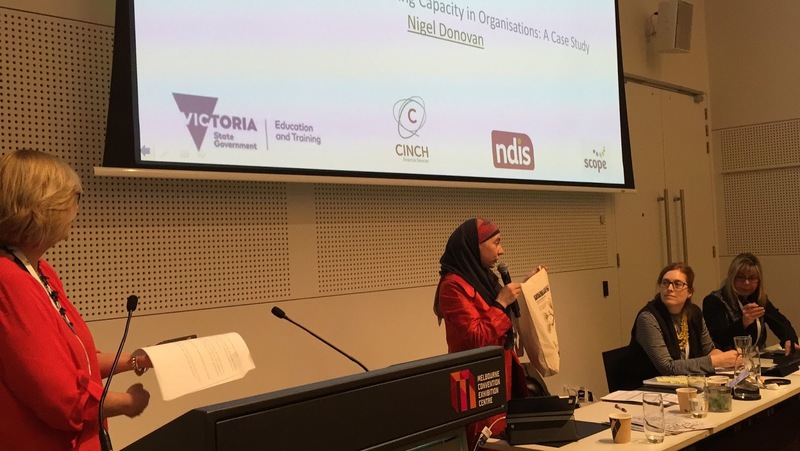 The audience was keen to hear more about how the innovative tools we have developed assist families develop a vision from which planning can unfold. What is the Now and Next programme? Now and Next is a short term programme launched in Sydney with Plumtree, a service provider dedicated to building capacity for families raising children with disabilities. We are collating our research data and will present evidence-based results soon. A short presentation can be viewed below. RadioNZ programme about the STARS!!!! Stoked about Katy Gosset's great reporting about the STARS programme!! Katy attended our graduation party and interviewed STARS and supporting actor participants about their experiences with the programme. WOW - it is so humbling to listen to people talking about the impact of the programme on their lives. Thank you so much Katy for telling this story! Reflecting on my experience in the disability sector, I am struck by the size of the task ahead. We have entrusted professionals with the authority and the belief that their expertise carries more weight than that of other stakeholder groups - such as people with disability and their families. This has coloured their relationships with these families in ways that we have lost control over. Most importantly, this has resulted in families' journeys being over-pathologised. Working from a family-centered perspective, we listened to parents who told us how their encounters with professionals could be improved. The key to such transformation lies in re-framing families journeys as learning paths. Listen to Ellie below who explains how she traveled on this journey. A decade ago, she had to find her own way - nowadays we can facilitate learning experiences to help others along these paths. Recording the STARS social media presence on FaceBook... Well done everybody! Social participation and contribution at its best! In the week leading up to the performance, it took a lot of convincing, cajoling, explaining, rehearsing to reassure him that he could not only overcome his fear of public appearance - but gain from it. During this time, I discovered many new facets of strengths in the young person I am supporting. He told me this experience taught him that he was able to fight the fear and anxiety he first felt and replace them with extreme pride. Denyse made him feel special... and so did the hundreds of spectators that gave him a huge round of applause. In the days following the show, we talked at length about the value of his learning and how he would use this insight to build strength at other future moments where it was needed. Even though I have been working with this young man for the past 6 years, watching him walk down the cat walk with such confidence and pride is an experience I will never forget... and I gather so won't he!!! Oh what a night!!! Our STARS were shining! 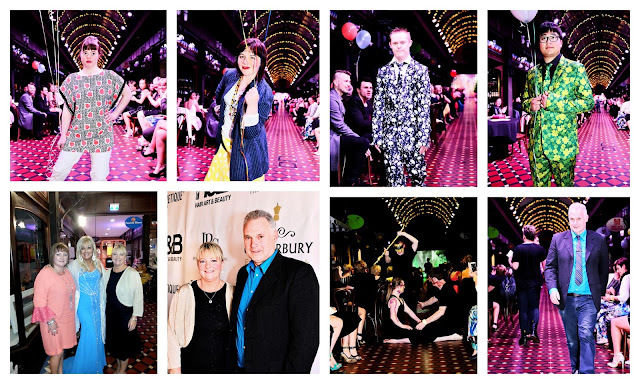 Dancers, fashion models and decorators... and of course their proud families!!! Thanks so much to sponsors, supporters, collaborators, helpers, volunteers and whanau for coming together and enabling this amazing night!!! The second STARS [Seeking Talented And Resourceful Supporting Actors] programme went out with a bang, with the support of our candidate job seekers. Denyse Saunders, a New Zealand fashion icon, invited our young talented disabled Cantabrians to join in her Canterbury Fashion Beauty Week Fashion show on Friday 9 Oct 2015 at the Tannery in Christchurch. VIP Events. 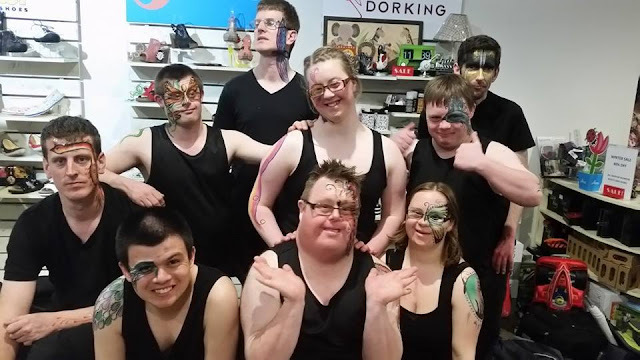 Designed by Irene Andrell and Annick Janson mothers of young disabled adults, this programme was crafted to provide a positive work experience for disabled young adults, and support future leadership aspirations... indeed our fifteen participants had an amazing opportunity to shine. Participants created 22 centerpieces for the VIP tables, performed a dance choreographed by Arts Integrated and walked down the cat walk and mingled with the best and most successful fashion people in the South Island! 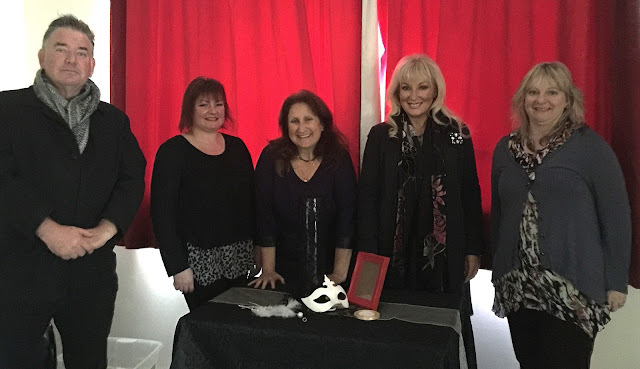 Huge thanks to: Denyse Saunders, Founder & Producer & Director, Canterbury Fashion Beauty Week and Mandie and Renee Co-Directors, VIP Events, James Saunders, at JRS Photographer, and the Arts Integrated Team. This initiative was supported by Manawanui in Charge, Enabling Good Lives Christchurch Demonstration and Te Pou. Families, support people and volunteers... we could not have done it without you! We are so lucky to be working with such amazing professional companies who have invited us to join them and are mentoring our young people. We met with a crew of very excited young people and their families and today we simulated a cat walk and planned our centre pieces. 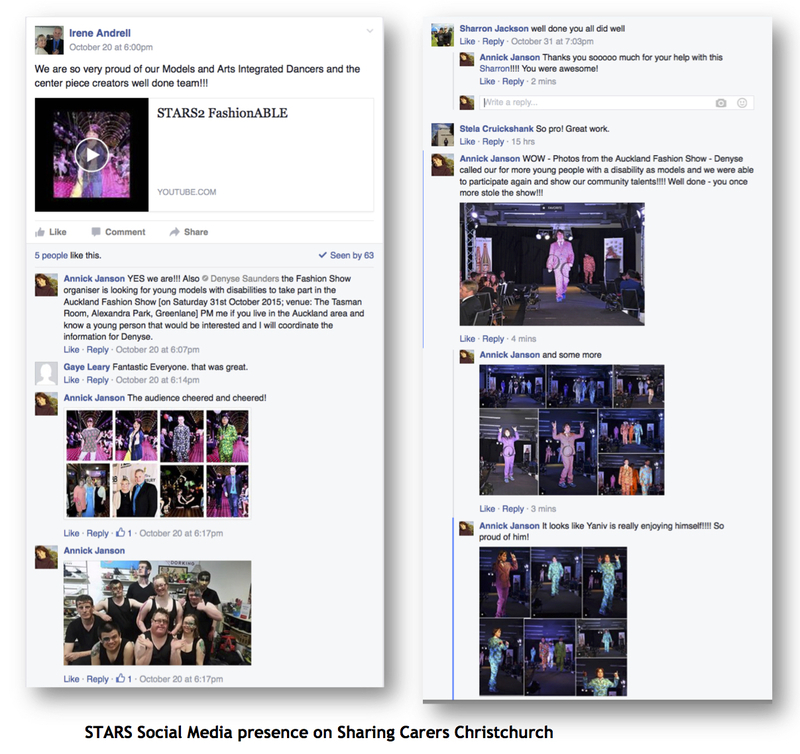 STARS2 has facilitated three types of opportunities for our young people to train/work: modeling fashion, creating centre pieces for the VIP tables and performing at the 2015 Canterbury Fashion Beauty Week. ... can you spot the STARS logo? Stoked to have discovered that the extraordinary Helen Sanderson and company have now put online their suite of (previously hard copy) tools to help disabled people and their families plan and achieve their goals!!! Watch the 5min. demonstration below to get a bird's eye view of the website's possibilities. Go to www.thinkandplan.com, register for free and start planning! Let's avoid wasteful duplication of such tools and services which weakens the disability sector and adopt each other's working innovations - so that the rest of our funding can be put to other use - and then shared with others! We are enthused thinking about future opportunities... more soon! Fashion-ABLE: On our way to the runway! 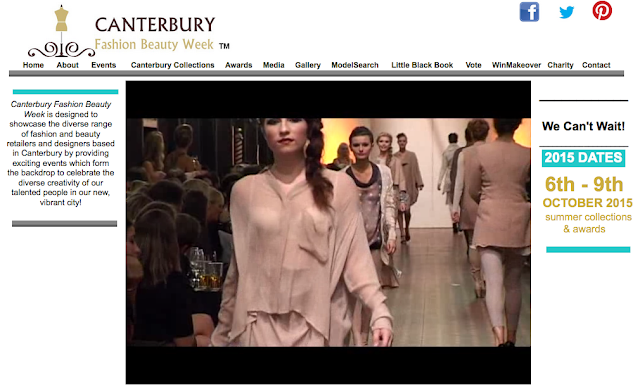 The STARS Fashion-ABLE programme was invited by Denyse Saunders http://www.cfbw.co.nz to join in her "Canterbury Fashion Beauty Week Fashion show" on the 9th Oct 2015 at the Tannery. Social valorisation is a leadership-building tool!... But how can we scaffold the transition to their first work experience when crafting socially valorised roles to support our children’s career aspirations? As we move from thinking about “activities” to fill time-tables to developing future professionals, we are challenged to find the right support people as well as valuable, authentic and positive work experience opportunities. 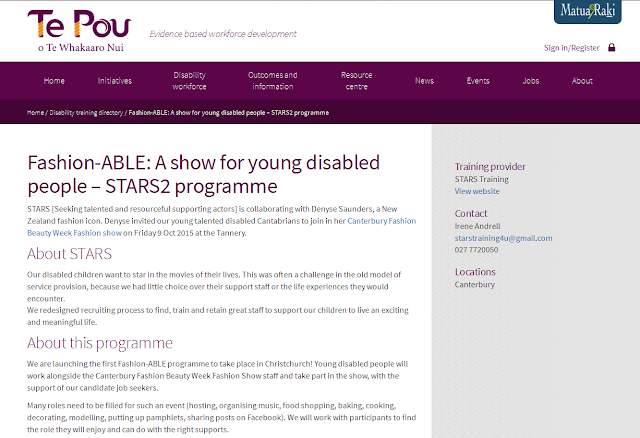 STARS2 draws on lessons learned from our earlier workshops to match potential support people to disabled people. 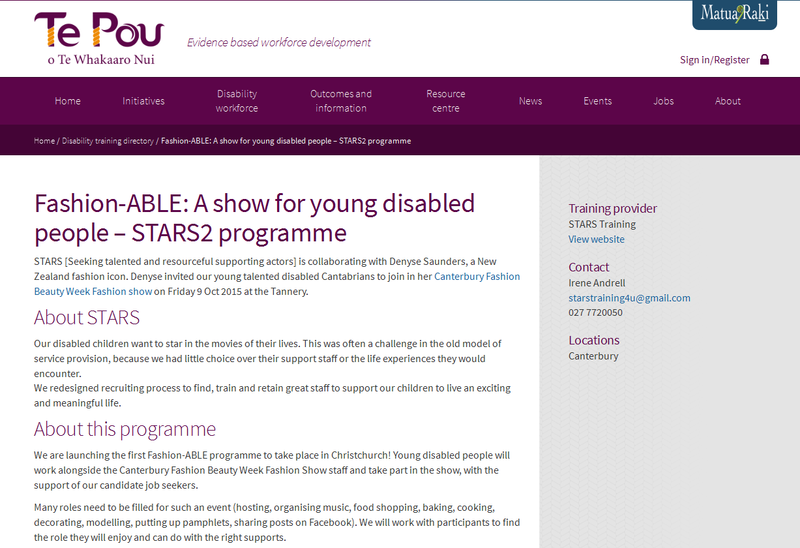 Hence STARS2 is launching the first Fashion-ABLE programme in Christchurch! Working for yourself - an attractive option!! One lesson our STARS training taught us in Christchurch is that it makes more sense to recruit Personal Assistants to support our people fill specific roles - sometimes new roles come up in the most unlikely places and times and families can be encouraged to develop ideas that they may have parked 'for later' because of their busy lives. Inspired by a Fashion show of another world!!! What a finale - full of fun, surprises and.... matches! Our graduates invited their families and friends. 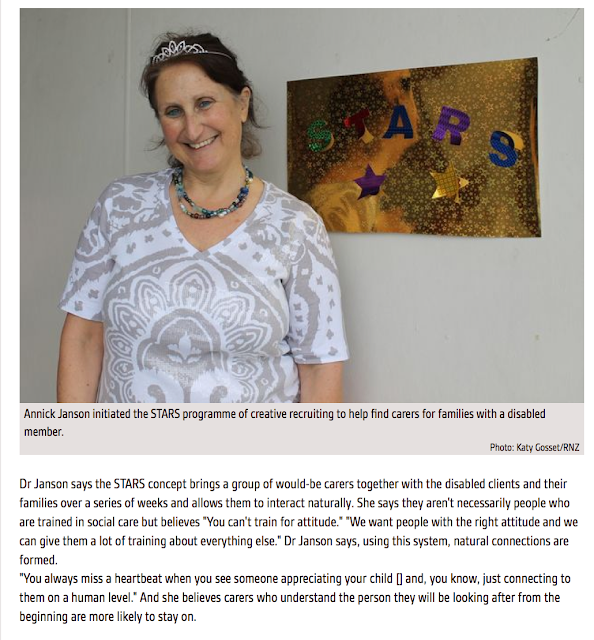 The STARS programme initiators and facilitators, Dr. Annick Janson, Irene Andrell and Sue Banks invited the families who had joined us in this 5 week ride. We also wanted to thank the organisations that supported us: Te Pou, Manawanui InCharge and Enabling Good Lives Christchurch demonstration. 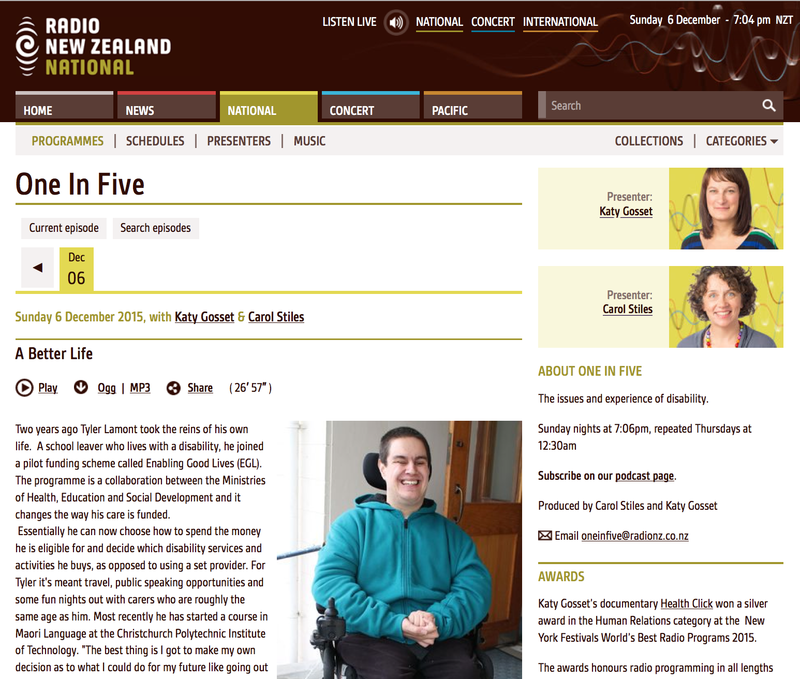 We particularly acknowledge the presence at our graduation of Gaye Leary (Manawanui InCharge), Gordon Boxall (Enabling Good Lives), Peter Campbell (Parent to Parent NZ Board), Adrienne Henderson (Te Pou) and Kathy Gosset (Radio NZ, Interviewing for the One in Five Programme). We'll be publishing more stories very shortly, explaining the matching process and the lessons we have learnt during STARS1 as we get ready for STARS2 - planned for August. Once again, deepest thanks to My-Life.org.uk for sharing the knowledge that they had accumulated by launching their Creative Recruiting programme - it was their enthusiastic spark that kept us going in the late hours of the night and small hours of the morning!!!! Thank you so much Caroline Tomlinson and Clare Roberts!!!!!! After the Speed Dating Job Fair session, all participants were very positive: the Job Fair was a great way to connect and meet with a large number of people in a short amount of time! Some matches took places already there and then! Some families said they would love another opportunity to meet our trainees with more time to explore common interests. We let this unfold during Session 4 for the families that joined us - for another 27 interviews in a natural setting to to take place ... and of course to planning our Graduation party on Saturday 16 May, 1- 2pm, 106 Main South Rd, Sockburn (click for map here) You're invited!! A first in New Zealand and Ministerial launch!! We were stoked that Hon. Nicky Wagner launched our Speed Dating - Job Fair on Saturday!!! 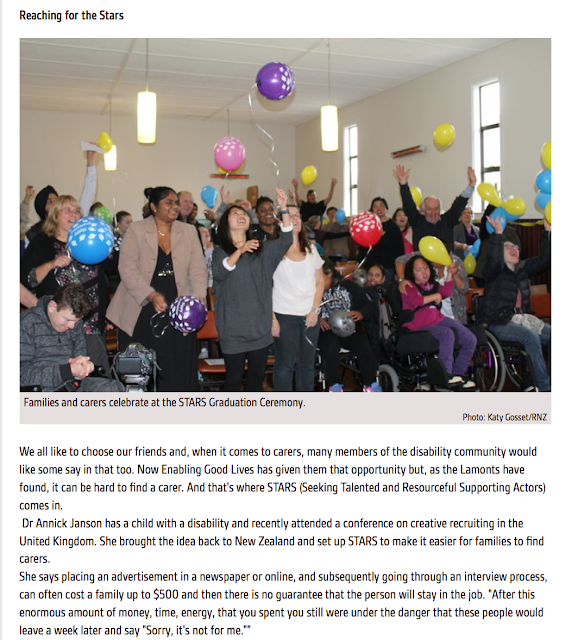 STARS training held a Job Fair - Speed Dating style first in New Zealand! Families looking for support staff to assist disabled people in achieving their good life met many candidates for a 1 hour session... The event was launched by Hon. 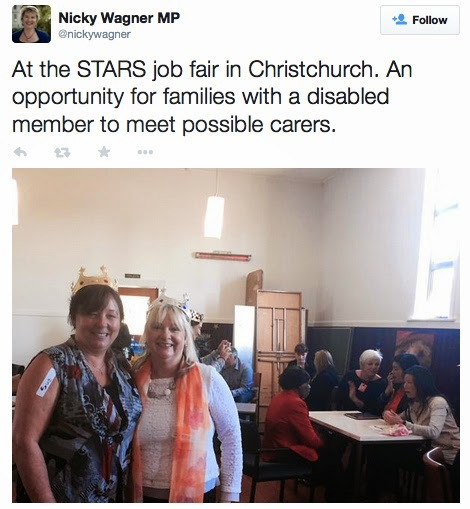 Nicky Wagner, Minister for Disability Issues, who is so supportive of initiatives such as this one! ... as well as listening intently to parents helping their children set up and run a micro-business. Below, Nicky is talking to Sandra about her daughter's laundry micro-business. Sandra is planning now for her daughter's future life. Because Prue has little communication and needs support around the clock, her parents planned for a house where she can move into in the future, when she is ready. Then they went on building a micro-business around Prue's interests and skills. Observing that Prue really liked the routine of washing, hanging and folding, Sandra is building a small operation for Prue to wash tea towels for a few businesses in her area. 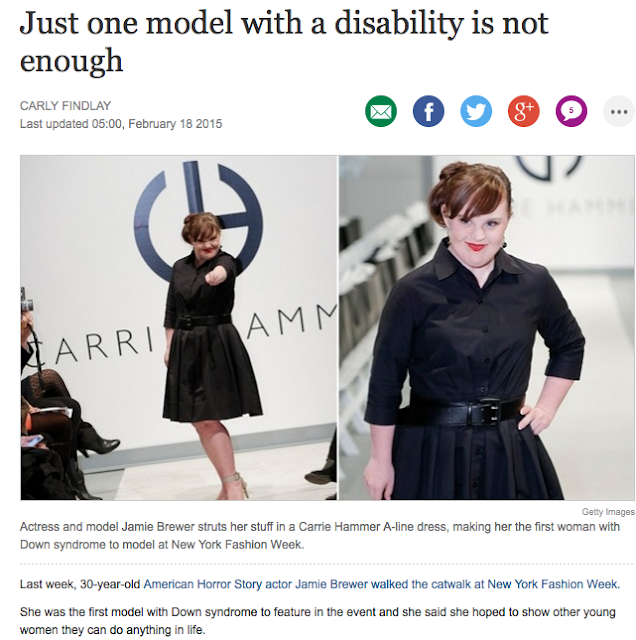 This is made possible with the help of support workers who can assist her and help with what she cannot do. Sandra is also interested in the social part of this business - in the future Prue will take on more interactions with customers and this will be an meaningful part of her life as well as a contribution she can make to her community. Sandra also reflects on the specific challenges of rural life for farming families. Whilst this sounds like a role on the big screen, it isn’t in the usual sense, but the concept is similar. A group of Christchurch parents have got together, to bring training for support people to work with their disabled young person. The idea has come from the UK-based group My Life who have had tremendous success with the programme. The families looking for great support staff aren’t looking for ‘carers’, they are looking for supporting actors to walk alongside their STAR in the movie of their life. Changes in disability funding now enable families to administer their own funding - this is revolutionising the job market opening career opportunities unheard of before. These families can now employ their own staff to support their family member in the community, be it swimming, movies, dance, horse riding etc. You name it there will be a young person giving it a go! The training programme is for anyone with the following qualities: Kind-hearted, glass half full personality, ready to give anything a go! Experience is not necessary. It runs for 5 consecutive Saturdays and each Saturday families are invited in for the afternoon to meet, mix, mingle and above all have fun with the trainees. On Saturday 2nd May from 1 to 2pm the STARS are holding a speed dating Job Fair for all families and job seekers in our community interested in trying this concept for an hour! All welcome! Join us at Our Lady of Victories - low building located at the back of the parking space at 106 Main South Rd, Sockburn, Christchurch. Our research involves talking to LOTS of parents about how they help their disabled child achieve their developmental goals. Some of the most inspiring conversations are about how parents become empowered to design assistive technology packages tailored to their child. The clip below is part of our Australian story-sharing project with Plumtree [plumtree.org.au/family-stories]. Parents feel grateful to live in today's world where they can easily access portable, flexible and adaptable technology. Parents share numerous stories of how they can rapidly adapt the capabilities of devices to the changing needs and skills of growing children with their ipads. We are collating these narratives into the largest disability storytelling project ever on our YouTube channel youtube.com/ecosynergygroup (>200 stories, ~35,000 views and growing) which parents listen to on their iphones whilst waiting for their doctors appointment. True 24/7 almost real time knowledge sharing. This begs the question as to why professionals, such as Occupational Therapists, Psychologists, Speech Therapists are so slow to uptake this liberating technology trend - sure there are isolated pockets of innovation, but in the mainstream, we are still dealing with old-school therapies and dinosaur technologies. This is why some parents are leading their own 'Assistive Life Design' movement - with the powerful tools they carry in their pockets every day - this is the type of social innovation that is on our research radar - because it will make the most difference in people's lives in the shortest amount of time. Rachel Price has 25 years experience in the disability sector. She talks about new opportunities in the context of the history of the sector and the shift that is happening towards building capacity with families and disabled people leading social change. One of these opportunities is to be able to use Individualised Funding to help people with their career aspirations - in particular creating a micro-business. She also talks about how families leading social change create new opportunities such as the Christchurch-launched S.T.A.R.S training programme! Our deepest thanks to our funders (Te Pou), to our mentor Caroline Tomlinson and the inspiration provided by Clare Roberts and the whole of UK My-life community!!! [www.my-life.org.uk]. This idea was born during an exchange facilitated by the International Initiative for Disability Leadership (IIDL) and is wholeheartedly supported by Manawanui InCharge and the Christchurch Enabling Good Lives demonstration. 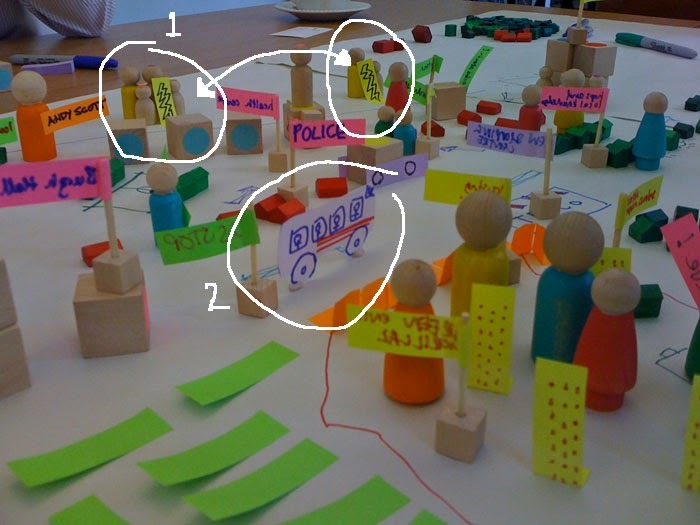 ABCD Asset Based Community Development - Let's do it!!! I like this approach over others I tried before (for instance the Ketso tool) as the above is a direct invitation to contribute and lead new initiatives rather than a mere description of what the community says. i was privileged to be part of 'Team K' at an early planning stage... Karim's talent is shining through acting in the video launching his workshop venture! With the direct support of Apple and Boston Consulting Group, he is expecting a meteoric career!! 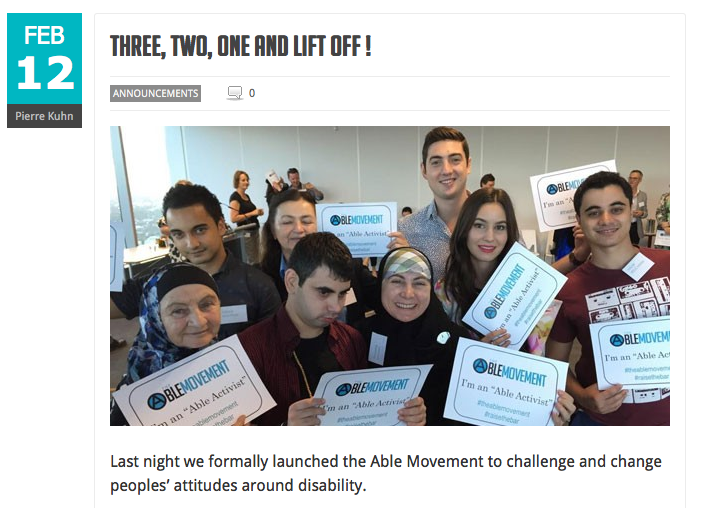 Karim's workshop raises awareness about how disabled people are excited to make contributions to their communities - but Karim won't be defined by his disability!! ... or view the clip on the Able Movement page at: http://www.theablemovement.com.au/karim-a-star-is-born. 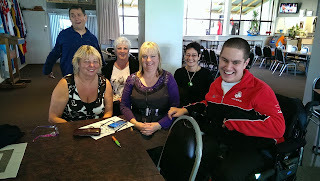 We took this photo of Karim's team below at the Able Assistive Technology Launch in Sydney in Feb 2015. Technology and Apps | new! Impact Studies and Methodologies is a group in Social Sciences on Mendeley. The Christchurch meeting where Creative Recruitment was born!